This Wall Brochure Display is Perfect for Waiting Rooms, Travel Agencies &amp; More! Many more configurations available now to best fit with the needs of your business! This wall brochure display is a great way to provide visitors at your locations with additional information. 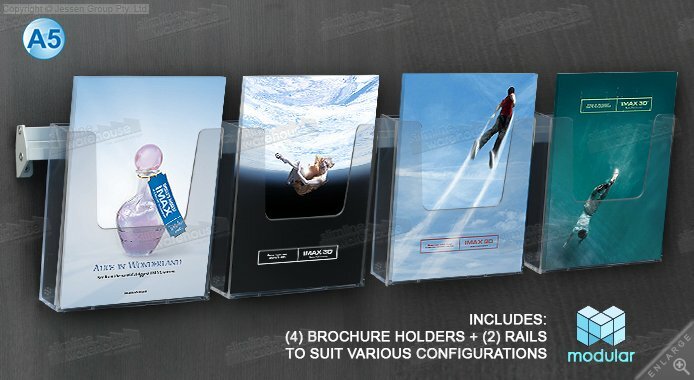 These acrylic literature holders are a useful product at many locations, including retail stores, real estate offices, exhibition halls, information centres, doctor offices, transit stations, and museums! 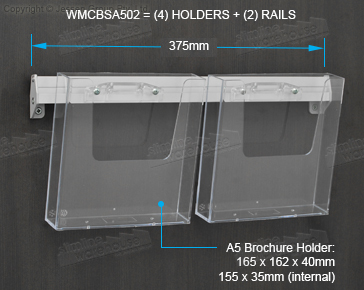 The wall mount magazine holder, wall brochure display can hold A5 (210 x 148mm) standard sized brochures, catalogues, magazines, & pamphlets. The (4) included pockets are made from clear acrylic in order to show passersby the entire catalogue to make it easier to see which ones to take home. These pockets also feature a cut-out that make it easier to grab the displayed magazines. There are (2) aluminium mounting bars that can be installed onto most surface using the included hardware kit. If not sure the included hardware is appropriate for your location, please consult with a local professional. These bars angle the acrylic pockets as well, another feature that makes them easier to read for patrons. There are different configurations possible with the two bars, such as a single line of (4) pockets, or a stacked 2 x 2 arrangement. Some businesses also stagger the bars for a stylish look! There are many styles of Literature racks for you to choose from in order to allow your business to find the right one that best fits in with your needs. With so many styles, finishes, sizes, & makes to choose from, there will surely be an item that will be beneficial to your company. Click here to see the hundreds of items currently for sale in our online catalogue. There are many diverse categories to choose from to outfit almost every facet of your business. Check out all the lecterns, noticeboards, sidewalk signs, light boxes, cigarette bins, light boxes, cafe banners, stand offs, iPad stands, & so many more we currently offer! 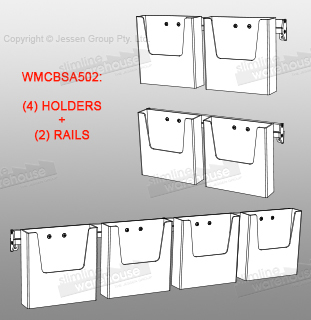 Slimline Warehouse has been a leading Australian provider of POP, POS, retail, & exhibition displays for over 20 years. Our combination of low prices on high-quality items has proved a winning combination that has helped us to grow a loyal customer base. Orders placed by 1pm EST on most in stock products will despatch same day out of our warehouse to anywhere in Australia, including Sydney, Canberra, Melbourne, Adelaide, Gold Coast, Perth, Brisbane, & Hobart!